Tag line: "He's Back With A Vengeance"
Picking up exactly one year after the events of Halloween 4, Halloween 5: The Revenge of Michael Myers opens with Jamie Lloyd (Danielle Harris) recovering in a children’s psychiatric hospital, so traumatized by her encounter with her uncle, Michael Myers (Don Shanks) that she’s lost the ability to speak, and plagued by nightmares that suggest Michael is still very much alive. Jamie’s condition piques the interest of Dr. Loomis (Donald Pleasance), who’s convinced she now shares a psychic link with Michael, which he hopes will help determine the killer’s whereabouts. Sure enough, Michael did survive his ordeal with the state troopers, and is once again searching for Jamie, putting the young girl, as well as her step-sister Rachel (Ellie Cornell) and family friend Tina (Wendy Kaplan), in great danger. 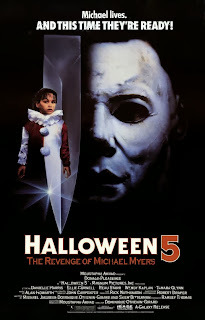 Like Halloween 4, a major strength of Halloween 5: The Revenge of Michael Myers is the performance of Danielle Harris, who shines as young Jamie Lloyd. In one of the film’s most poignant scenes, Jamie, who's fast asleep, flashes back to the events of one year earlier, causing her to wake up in a panic (she tries to scream, but nothing comes out). It’s a truly inspired performance, with Harris perfectly conveying her character’s deep psychological trauma, often doing so without the use of dialogue. In turn, Don Shanks slips nicely into the role of Michael Myers, who’s just as violent as ever (a Halloween party, which is being held at a local farm, features some particularly memorable kills). Throw in a mysterious man in black, who seems to be shadowing Michael as he makes his way through Haddonfield, and you have a movie even casual fans of the series will enjoy. Halloween 5 does have its problems, chief among them the character of Dr. Loomis, who’s more unhinged this time around than in any of the previous movies, making him much less sympathetic (at one point, he nearly attacks poor Jamie while she’s lying in her hospital bed, demanding that she tell him where Michael is hiding). I also wasn’t keen on the addition of two bumbling cops (played by Frankie Como and David Ursin), who were clearly intended to serve as the comic relief (they were way too stupid to be either believable or funny). Yet, in spite of these issues, Halloween 5: The Revenge of Michael Myers is a decent enough horror film, and an effective continuation of the Michael Myers saga.